Newport National members enjoy a wide variety of fun and exciting golf events throughout the season. Below are some of our reoccurring member events. For specific dates and times or to sign up for a specific event please refer to our upcoming events calendar. The Member ABCD Outing, or also known as “Opening Day,” is a favorite of both the staff and membership. Not only does this event represent the arrival of a new season, but also gives NNGC staff the opportunity to put our first class golf course and service on display for our new members and also our returning members. The tournament features a “shamble” format, where the best drive of the 4 team members is selected, and each player plays their own ball into the hole from that spot. Players receive 90% of their handicap strokes, and teams are comprised of an A, B, C and D player all based off handicap ranking. This event is extremely popular because it gives all members a chance to interact with people that they may not typically have the opportunity to meet. A great day on the course is followed by dinner and drinks on the deck, an excellent way to welcome on the new season! The Summer National is the feature member-guest event at the club. It is played during peak season, when the golf course is in elite condition and the golf facility is in full swing. This event gives membership the opportunity to invite 1-3 guests and show off NNGC’s elite service and golf club. The format for the day is best ball gross and net of each team, with each player being awarded 90% of the handicap for the net division. Teams are separated into flights, and the low score from each flight advances to a one hole alternate shot playoff on the picturesque 18th hole. Tournament participants armed with cocktails gather along the fairway to watch the entertaining playoff and see who will be the year’s Summer National champion! The competition is as entertaining as it is intense, and great times are had by all. Let us not forget our famous “Beat the Pro” competitions, where participants who “beat the pro” on our signature 13th hole will have a chance to chip off from our NNGC deck to the putting green to determine the prize winner. The popular wedge off from the deck in front of a boisterous crowd is where NNGC legends are made! NNGC offers a “Net” division where players are awarded 100% of their handicap strokes, and also try to qualify for the 8 spots in match play with hopes of winning the Net Club Championship. For our lovely ladies at Newport National, a two day stroke play event (both gross and net) determines who our ladies club champions will be. An extremely casual and relaxing competition has always been a great experience for all of our NNGC lady members of all golfing abilities. The Newport National Four-Ball is our summer ending event where the staff rolls out the red carpet for the tournament participants. Unlike most member events, this event is open to our daily golf guests as well who are proud to call our facility their summer golfing home. Members and guests alike will look to pick the right partner, as the best two player team on that day will be crowned Newport National Four-Ball Champions. Superintendent Scott Roche works tirelessly all summer to ensure that he serves up the golf course in pristine condition for this showcase event. Along with the exquisite golf course, NNGC staff serves up first class VIP services only available for this terrific event. We hope to have a large amount of participation from membership, as we would like to keep the trophy in the hands of one of our valued members! The National Cup is one of the newer NNGC events that may be one of the most popular. This is a member-only Ryder Cup style event, where those members who claim Aquidneck Island as their primary residence, face off against those members who are Mainland residents. Each team has up to 12 players (based on participation points*) and are filled by those who are first to sign up. Members who participate in the other major NNGC member outings are given priority when signing up (based on how many tournaments participated in). The “resident” team is captained by our PGA Pro, Brandon Hitti, and the “mainland” team is captained by our Assistant Professional, Frank Russo. 3 separate matches (6 holes partners alternate shot, 6 holes partners better ball, and 6 holes individual match play), determine which team gets to claim the National Cup for the year. 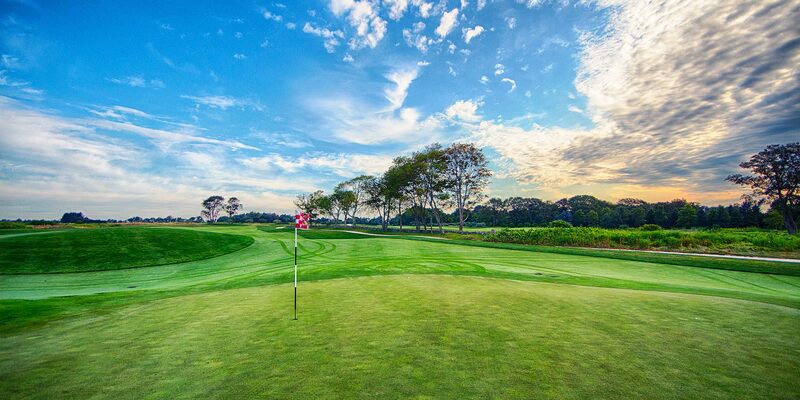 This event is extremely popular with the membership for its lively atmosphere and competitively fun nature, a fantastic way to end a great golfing season at New England’s premier semi-private facility. The Orchard Cup Series will be played weekly on Sunday mornings, featuring different weekly themes and formats. Sign-up emails will go out in the beginning of the week, and members will have the option to sign up individually, or with guests. Each event will provide a fun opportunity for members, new and old, to meet and enjoy fun and relaxing formats that are sure to provide plenty of summer memories. Each one of these events will also count toward your “participation points” to gain entry into the popular National Cup event. Pro Shop credits will be handed out for the top finishers weekly and overall at the end of the season. Along with Pro Shop credits, points will be awarded weekly to the top overall finishers. The top finishers on the “points list” will receive priority entry into the popular National Cup event! Come try your luck for the chance to take home a reward! Newport National blends a proud reputation for golfing excellence with prominent service in a family-friendly, first-class golf club. Newport National is proud to have been chosen as one of the “Top 20 New Courses in America” by GolfWeek magazine upon it’s opening. Our world-class club provides our members and guests a warm friendly environment with a level of service and quality country club members throughout the world have come to expect. Whether you have been golfing your entire life, or have just begun to appreciate the game, Newport National offers a membership plan that will fit your needs.